Efforts to secure a comment from Hon O’Neal on this development proved futile. Residents of the sister island seem to be at their wits end because of not having enough attention being paid to their livelihood. “Our representative comes here when there is a funeral or things like the Farmers’ Week, we have so many things for him to address for us but we cannot raise them at those [fora] when he comes here,” said one resident. “The leaders, NDP, VIP, churches, everybody need to step up their games and do what there are supposed to be doing,” insisted another resident. They have also called inspirational programmes to be organized to guide youths and business entrepreneurs of Anegada. “Our district leader has the power in his hands to do those things, we will help but he has to take the lead, we here need help, things not getting any better for us, it is not and we are hurting,” the resident said. WEST END, Anegada, VI – Residents of Anegada complained of being treated with scant regard at the Island’s Farming Week activity, designed to ensure a certain level of interaction and show of support for all the people of the Virgin Islands. “This is how they treat us here, just look at this, where is the Minister for Natural Resources? Anegadians are the forgotten stepchildren, they have no regards for us,” said an obviously frustrated resident of Anegada Mr Jerry Vanterpool. “When it was the graduation we invited them, they didn’t come, now this is Farmers’ Week they put House of Assembly above us, they ain’t come. This is nothing but an insult to the people of this Island,” Mr Vanterpool added. This was the very feeling of several others of the Island and while they had chosen not to be named, they expressed their deep feelings of much hurt and insult. “This is nothing strange and Mr Jerry is very correct this is a shame. They make us feel as if we are not as important as the people of Tortola and Virgin Gorda. Those two Islands are the BVI…we are off the BVI map based on how they treat us,” said a senior citizen. Those feelings were expressed even before word was circulated about the ‘drama’ that had occurred resulting in Representative of the Third District Honourable Julian Fraser, RA walking out of day one of the Fourth Sitting of the Third Session of the Second House of Assembly. One farmer said that she was pleased to have seen Representative for the Ninth District and Leader of the Opposition The Honourable Ralph T. O’Neal OBE and Representative for the Second District The Honourable J. Alvin Christopher present. “Mr. O’Neal is an aged man and he is here, Mr Christopher is here too interacting with everybody. I ain’t see him (Hon Christopher) sit down for ten minutes. He up and about with the people. Mr O’Neal sponsored two major awards here. That is how you show that you care about your people,” said the woman. She further added that she had reason to believe that the Ministers of Government had prior knowledge of the date for Farmers’ Week and could have set the sitting of the House to allow the relevant Minister to attend. It was during a subsequent interview with Hon Christopher that it was noted that the Fourth Sitting of the Third Session of the Second House of Assembly was initially scheduled not to cause a clash but was changed to suit other agendas, including off island travel of some members of the NDP side of the HoA. Adding fury to fire, the entire audience at the official opening ceremony was hushed silent, some in shame and disgrace, some out of sadness and some in shock, when the instructor of the Claudia Creque Educational Centre steel band took to the microphone. The woman spoke of her disappointment about the school band being left off the programme even though they were told to be present to perform. When the band was called upon to play just a few members were present as the band instructor related openly that the children were hurt and embarrassed when they did not see them listed on the programme and they returned to their homes very disappointed. “I only allowed the few to play out of respect for Hon O’Neal because he is always there for these children he would sponsor them when they have to go off island to play and such like. He is very supportive of us,” said the instructor. I went to Anegada on Monday, and was very disappointed when I was made to understand that there was a clash of activities, which rendered the government members (except those mentioned in article above) unable to attend the Farmers Week activities on that island. Yes, I agree that the Anegadians were treated like step children, for the Farmers Week celebrations are held around the same time each year, and in our small Territory the two activities should not have been allowed to clash. After all, they both come under the Government's umbrella. To me it was a definite slight, for the farmers need encouragement, and who better than our elected representatives to show them that they are behind them 150%? 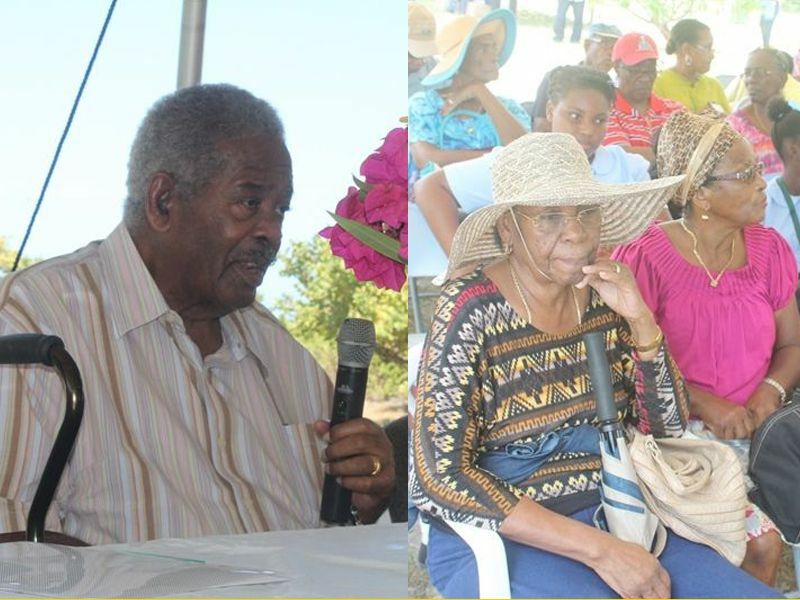 Since the Farmers Week activities are now in a rather remote area, there should have been a shuttle service providing free transportation so that the seniors on Anegada could have attended. They used to be a staple at the activities, and they were sadly missed. If we are going to do this thing, let us do it right. And by the way, the representatives' absence at the Jost Van Dyke activities also spoke volumes. The children, who we are trying to rope into agriculture, are watching us keenly. We need to set proper examples if they are to follow diligently in our footsteps. I applaud Hon. O'Neal (who visited Anegada) and Hon. A. Christopher, who was present on both Anegada and Jost Van Dyke, for their caring nature. Anegada, VG, JVD continue to do the same thing for over 20yrs and expect different results. That's the definition of...well, look it up! that definition is "insanity". But why are these three islands "insane" if they have been holding an event for over 20 yrs? I too was surprised and ashamed that none of the NDP leaders showed up. What a slap in the face and this is why our sister islands do feel like stepchildren. NO R E S P E C T and downright disgraceful. You mean to tell me NOT ONE of them felt we were important after working hard all year and paying our taxes too? SHAME ON ALL OF YOU! If it wasn't for O'Neal and Christopher we would not have been acknowledged at all. What nonsense is "the instructor" talking the students were right on the programme... I here watching the programme now... Vino aya need not print these chupid ppl lies please! The person you refer to is not an instructor but a leader of the church youth band that was supposed to play. Some of the school children play steel pan for the church but the programme made it look like CCEC was supposed to play only; the error was that it should have said church band or something like that to differentiate the groups..... simple mix up! The people long for the day when the NDP will be gone and I too. The disregard for the people is working well for the NDP gang. Anegada has 4 other representatives besides the member for the 9th - they could call them out also. While i understand the having a separate district for Anegada and JVD is costly, it is the only way that these islands will get the treatment they deserve. Who is better to represent an island than the person who have grown up there. I am so tired of begging for items Govt. should provide for us.